Facebook CEO Mark Zuckerberg will face questions from two congressional panels next week about how his company handles its users' data. He's set to appear before a joint hearing of the Senate Judiciary and Commerce committees on Tuesday afternoon followed by a House Energy and Commerce Committee hearing the following morning. "Our joint hearing will be a public conversation with the CEO of this powerful and influential company about his vision for addressing problems that have generated significant concern about Facebook's role in our democracy, bad actors using the platform, and user privacy," Sen. John Thune, the chairman of the Commerce Committee, said in a statement Wednesday. Sen. Chuck Grassley, the chairman of the Judiciary Committee said the hearing "will explore approaches to privacy that satisfy consumer expectations while encouraging innovation." The House Energy and Commerce committee hearing "will be an important opportunity to shed light on critical consumer data privacy issues and help all Americans better understand what happens to their personal information online," said a statement from Reps. Greg Walden and Frank Pallone, Jr., the chair and ranking member of the committee, respectively. The Senate hearing will take place at 2:15 p.m. ET on April 10 and the House hearing at 10 a.m. ET on April 11. 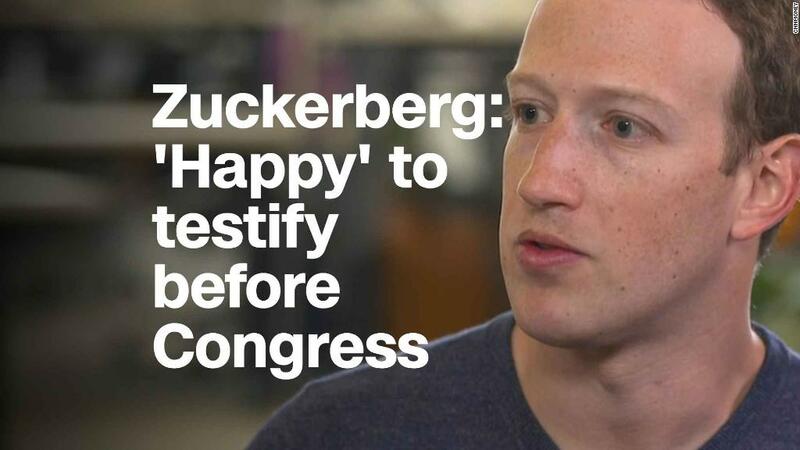 CNNMoney broke the news last week that Zuckerberg was coming close to securing a date to testify before Congress. Facebook (FB) has been under fire after the revelation last month that the data firm Cambridge Analytica was able to access information from tens of millions of Facebook users without their knowledge, and lawmakers have been clamoring for Zuckerberg to testify. After criticism over his initial silence following the Cambridge Analytica news, Zuckerberg has been on a press tour within the past few weeks, talking to CNNMoney, Vox and The New York Times. In a conference call with reporters on Wednesday afternoon, Zuckerberg said Facebook will never be able to fully protect its platform from abuse by bad actors no matter what it does and that efforts to improve security will be "never-ending." Facebook COO Sheryl Sandberg is also speaking publicly this week, beginning with Bloomberg and PBS NewsHour on Thursday and NBC's "Today" show on Friday morning.